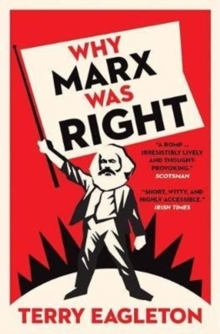 In this combative, controversial book, Terry Eagleton takes issue with the prejudice that Marxism is dead and done with. Taking ten of the most common objections to Marxism-that it leads to political tyranny, that it reduces everything to the economic, that it is a form of historical determinism, and so on-he demonstrates in each case what a woeful travesty of Marx's own thought these assumptions are. In a world in which capitalism has been shaken to its roots by some major crises, Why Marx Was Right is as urgent and timely as it is brave and candid. Written with Eagleton's familiar wit, humor, and clarity, it will attract an audience far beyond the confines of academia.